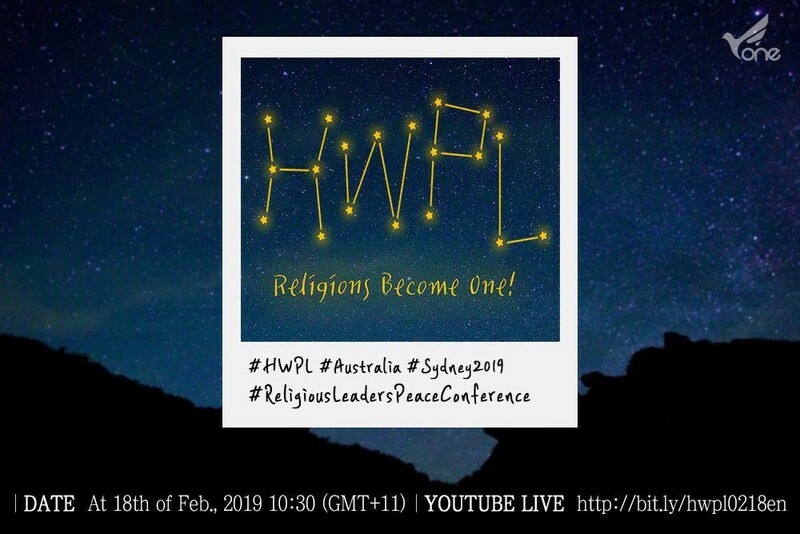 On February 18th, 2019, HWPL held a conference called ‘Religious World Without Discrimination, Religious Leaders Becoming one’ in Sydney, Australia. 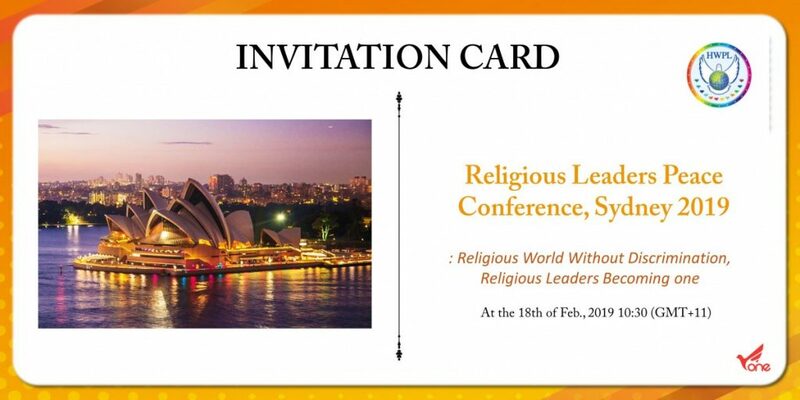 Along with about 370 audience members, 30 religious leaders representing 7 different denominations, including Christianity, Buddhism, Islam, Sikhism, Hinduism, Zoroastrianism and Caodaism, are gathered to discuss the Role of Religion. During the conference, the theme of ‘religious discrimination’ was also discussed. 4 keynote speakers delivered messages regarding unfortunate cases of religious discrimination and the need for concrete action plans. 30 religious leaders signed the Statement Denouncing Coercive Conversion Programs and Religious Discrimination and proclaimed their support for the Declaration of Peace and Cessation of War (DPCW). Why did religious leaders gather? A religion has its role that should spread love and peace. But Destorying individuals and families with powerful authorities is our reality. Furthermore, it induces conflict between religions and countries. Religious people are doing violence and oppression in the name of God and making the global future darker. If we want true peace now, we must stop. 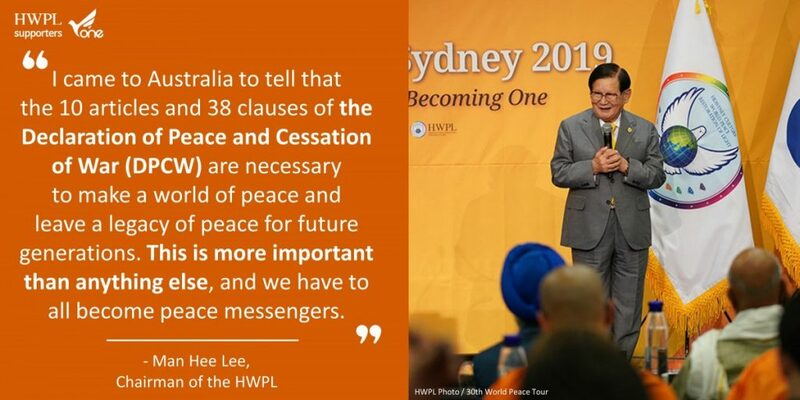 Man Hee Lee, Chairman of HWPL, emphasized “There’s nothing more shameful than knowing that the majority of wars are caused by religion. And not only that, but should fighting and taking people away by force and beating them be happening? This is not a religion. In order to achieve peace, even our religion should become one.” The Chairman Man Hee Lee strongly proclaimed religions must become one in order to achieve peace for humanity. Religious leaders are not people with little influence. Every word of them is powerful. Religion and ideology are the key reasons for world wars. Once religious leaders have a good heart, the world is at peace. But if religious leaders take the wrong mind, who can take responsibility for the deaths of those countless people? What is the Answer to Peace? Do you think peace can be achieved? When we are making a living, spending my personal time, there are people who risked their lives for peace. They are the messengers of peace of HWPL. Especially, despite being over 80 years old, the chairman Man Hee Lee is ahead of all others in work of peace. This is why he is called “the Father of Peace” and why he is supported by 1.6 billion Youth and 3.7 billion Women. To prohibit the discrimination between nations and religions, HWPL proposed great peace plan called the DPCW. It is a powerful bill that prevents war caused by religion. The Declaration of Peace and Cessation of War (DPCW) has articles to be able to end the war. Article 8 – “Freedom of religion”, Article 9 – “Religion, ethnic identity and peace” and Article 10 – “Spreading a culture of peace” are examples. For this reason, Religious groups are strongly urging for the DPCW legislation. At HWPL’s WARP Office, approximately 20 religions and 2,410 people attended. They find the right path for religion through Scripture Comparision and Confirmation. The chairman Man Hee Lee emphasized “There will only be fighting if there are two or three, or hundreds of religions. But if the scriptures become one then so do the religions. In order for us to be born anew and to become one, we need to know some things that are wrong in our own religion, and to grasp reality.” HWPL is to eradicate social problems caused by religion. Establish international cooperation and solidarity. What happened all over the world? There are numerous religious problems in the world. As you can attest, you can see from the story of Nadia Murad, the winner of the 2018 Nobel Peace Prize. She is a victim of Coercive Conversion to ISIS. Also in South Korea, two people were killed by coercive conversion. Religious leaders who support world peace strongly criticized this incident. In particular, peace activists around the world protested for the 27-year-old Gu Ji-in who suffocated of coercive conversion in January 2018. Foreign media such as The New York Times and the Washington Times also helped the victims like Ms.Gu. Peace has always been a distant future for us. However, if religious people all over the world become one, “Peace” will become reality. Let us all work together with the mission of peace. “WE ARE ONE! WE ARE ONE! 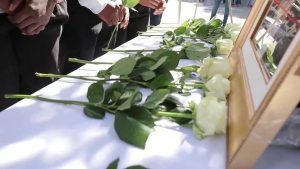 The International Women’s Peace Group (IWPG) held several memorial services across the world in honour of the late Ji-In Gu – a young South Korean woman who passed away while being forced conversion. The memorial service took place 49 days after Gu’s death (December 2017) which is a Korean tradition and was held in Cape Town, Johannesburg, Port Elizabeth, Harare, Zimbabwe, as well as in Windhoek, Namibia. On January 28, 120,000 South Koreans also protested in major cities against coercive conversion program by the Christian Council of Korea. (More info) Not only in South Africa, the memorial service has been held in the LA, United Kingdom, and other parts of the world for a year. 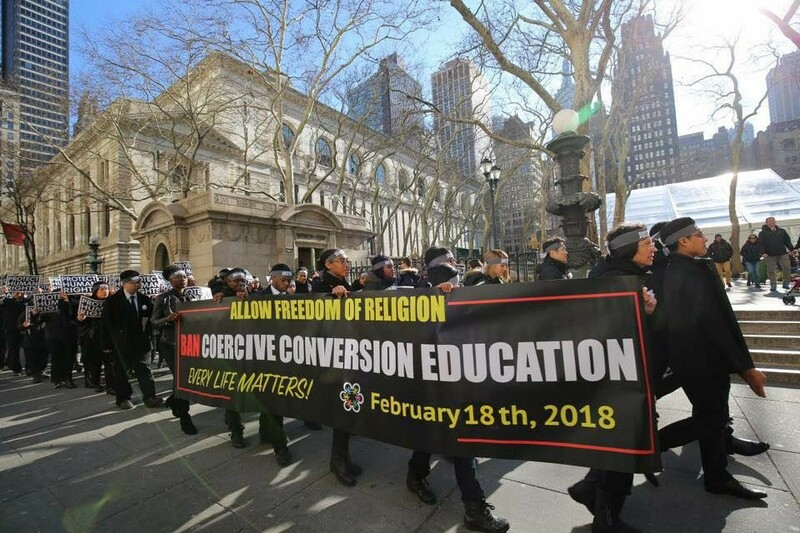 Especially during November and December this year, New York Times and other leading press reported with the headlines “Ban Coercive Conversion,” and shared the events of the late Ji-in Gu. Why is the memorial continuing? As we celebrate the first anniversary of memorial, why is it reported by the leading foreign press? Why is the memorial continuing? That’s because nothing has changed in a year and the government hasn’t responded. Why? First, the Coercive Conversion Program is still underway. 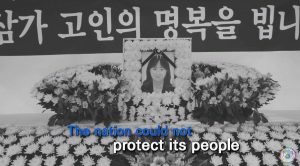 Sometimes religious suppression occurs in war and emerging countries, but no one would think that Murder by coercive conversion occurred in the South Korea, K-pop’s home country. So far, the number of victims is over 1,000. 52 percent of them claimed they were imprisoned. 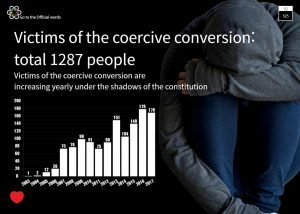 (The AVCCP statistics) In addition, 42 percent of the victims were taken to coercive religious conversion program by kidnapping. 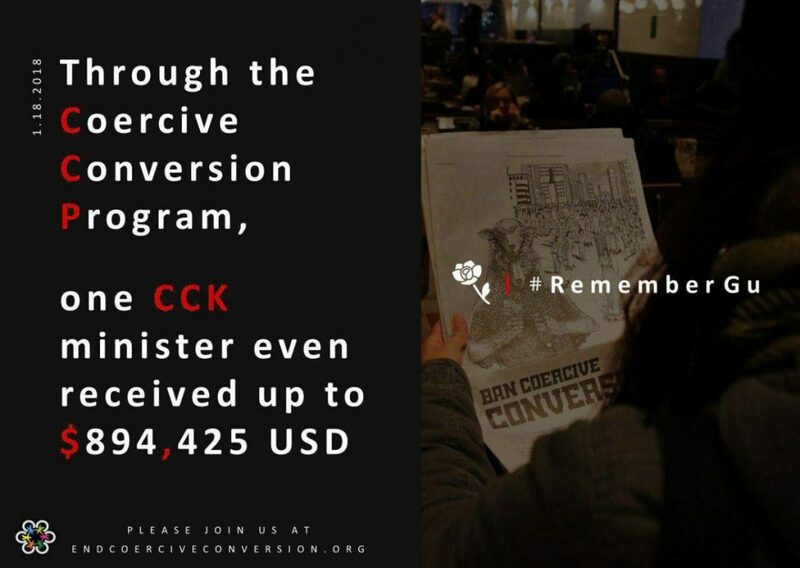 After this anti-humanitarian act, one conversion pastor of the CCK even received up to $894,425 USD. How can this illegal thing still happen? Second, Conversion pastors cowardly evade the law by using the excuse of ‘counseling’. They claim that these consultations on “cult issues” are carried out voluntarily at the request of the family members of the victims and with the consent of the victims. However, victims report that the “conversion education agreements” are written by force while they are under confinement. 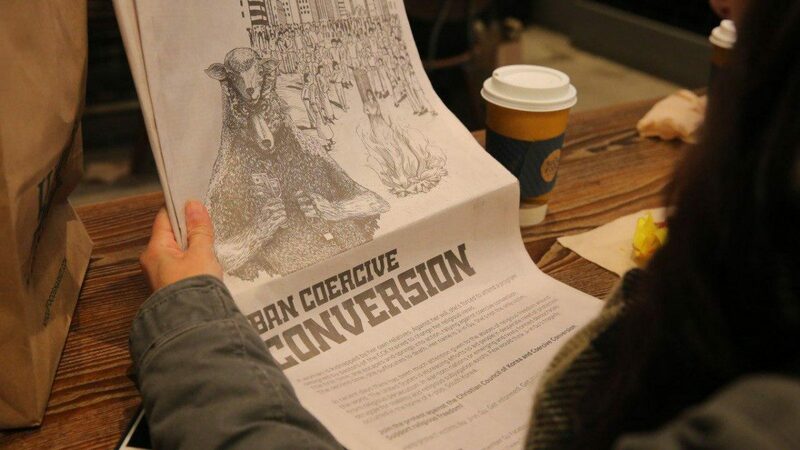 So Human rights activists and IWPG members around the world have continued to petition for the Korean government to enact a special law against coercive conversion program. In a similar case, 1,000 Pakistani girls are kidnapped and forced to change religion every year. Muslims only just said “It was to encourage cults to accept the Islam.”Many human rights activists spoke out, and in the end the government made a anti-conversion law. In November 2016, the Sindh province passed a law criminalizing forced conversions to, according to the law, ‘provide protection for those who are victims of this abhorrent practice.’ Under the law, those convicted of forcibly converting others receive a punishment from five years’ imprisonment to a life sentence. Why hasn’t anything changed in a year? Because the Christian Council of Korea (CCK) is trying to hide the truth, not only by neglecting the law and looking the other way, but by supporting its affiliated pastors’ illegal activities. Politics and religion have the cozy relations, which violates Article 20-2 of the Constitution of the Republic of Korea, “Religion and politics are separated.” Who will console the pain that 1,000 victims of coercive conversion in Korea have experienced? Who can compensate for Ji-in’s death? 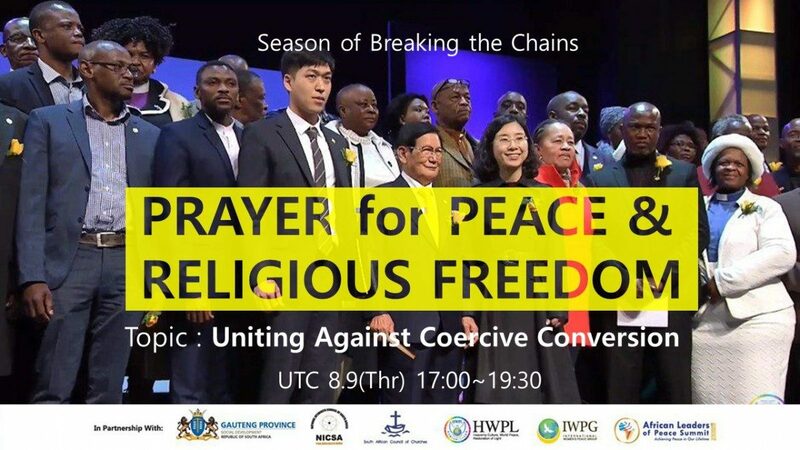 Furthermore, HWPL has already vehemently protested against the CCK, which has abandoned its function as a religious organization, and its affiliated pastors for conducting anti-nation, anti-society, and anti-peace acts that violate human rights. The CCK must to be disbanded for throwing the Korean people, as well as the international community, into chaos, and the pastors who took part in coercive conversion must receive the proper punishment for their actions. Human Rights is up to you :0 Good luck! A person at birth can not choose a country by himself, but he has a right to choose a religion. But in some countries, someone has to trade life for one’s belief. The countries that have been under religious persecution are the China, Iran and Myanmar. Some countries have civil wars because of other religions. This led to the loss of many precious lives. Even in Korea, where religious freedom is believed to be guaranteed, two people have already died of coercive religious conversion program. 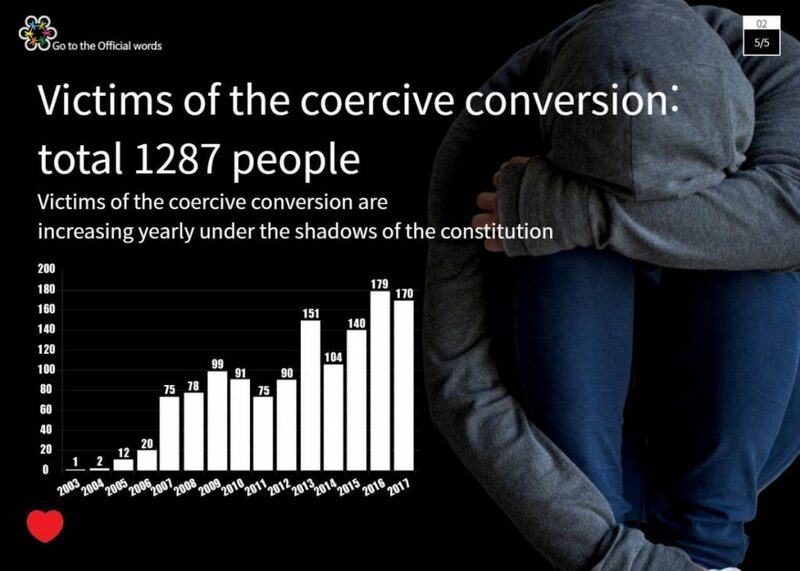 More than 150 people a year suffer human rights violations during coercive conversion program. What’s worse is that more than 1,000 victims were confirmed. There must be a good reason to keep her religious beliefs under life-threatening coercive conversion program(CCP) and her choice deserves to be respected. Human rights and security of minority religious people are not protected against those who are inclined to kill them. Because they can’t admit the faith of minority religious people. Moreover, narrow religious discrimination, that believes only his religion and doctrine are right, causes serious religious extremism and drives all the world into terror and violence beyond some regional conflict. As a result of these, 80 percent of the wars that panicked the world in fear are religious wars. If you are a religious person, you should have to work for peace and prevent war. Instead, the fact that religious people are more at the center of the conflict is shameful and it means that they have no qualification as a religious person. Despite international efforts to promote religious freedom, restrictions on religious freedom and religious discrimination are still on the rise around the world. To solve these problems, a strong international law is needed to eradicate religious discrimination and ensure religious freedom. The Declaration of Peace and Cessation of War (DPCW) presented by HWPL, which has become a key issue in the international community, has a provision for freedom of religion. 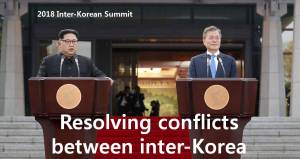 The solution for sustaining peace is to enact an international law (10 articles and 38 clauses of the DPCW) to end war and implement it to the letter. If the leaders of every country love their country and their people, they have to sign the International Law for peace. To do this, we must complete peace with the spirit of that moment when the United Nations begins. 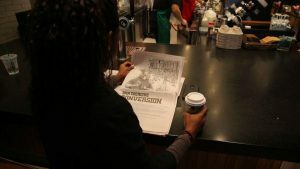 A New York Times advertisement space on November 28th dealt with women human rights issue. I will introduce you to New York times Human Rights News! On November 25, it is the ‘U.N. International Day for the Elimination of Violence against Women‘. It was the day in 1981 when three sisters of the Dominican Republic protested against the dictatorship of the government. The Day was started to remember that sisters were killed by violence, and many people from all over the world including Spain are participating in demonstrations and holding campaigns. Despite these efforts, a 25-year-old woman died in a pension in Korea on January 18, 2018. Why did she have to die of suffocation when she had so many dreams? Why did parents keep their adorable daughter in custody? Human Rights is still alive? The United Nations Charter confirmed people’s beliefs about basic human rights and promised to keep this human rights. To make sure that we keep this promise, we have to define ‘what human rights are and what freedom is’ that everyone can understand. It is the Universal Declaration of Human Rights which is now the most recognized. But despite these efforts, there are still many incidents of serious human rights violations. On December 30, 2017, a 25-year-old girl left her friends with a message saying, “I will travel with my family.” Then on January 18, 2018, she returned to us as a ‘cold and blue corpse‘. According to one friend’s testimony, the late Ms. Ji-in Gu was a ‘nice friend who spent time with his family when she was busy and she had many dreams and was so passionate.’ And her friend continued “I’m so sorry and angry. I miss her terribly.” She was imprisoned in a pension in South Korea. After a scuffle with her parents, she was presumed to have choked to death. There is a message left by Ms. Gu in her lifetime. “Hello. I’m Ji-in Gu. Mr. President, Please listen to my story. Stop the painful kidnapping, detention and endless assaults in 44 days.” Yes, that’s right. It was not the first time that Ms. Gu was kidnapped and detained. She was imprisoned for 44 days in a monastery on June 2016 and she had a really painful time both soul and body. I mentioned it in my posting, but a year later, nothing has changed. Maybe she’s crying in the sky. “She petitioned the president for help, but nothing changed and she died. Will you take action after I die?” said Ji-in’s friends. You can feel the depth of sadness in their memorial songs. How lonely you are in the darkness, not open even when you pat. Even in our dreams, we meet again. Because always we dream the same dream. Human Right is up to you :0 Good luck! What is the world like now? Jungle? Heartless modern society? Of course, it is. But I heard there are people who pray for the world. In fact, I have been having a hard time these days. In the news, murders, accidents, and crimes are never stopped, and What if I become a target of crime? Whenever I think of this, I pray. Today I saw this YouTube clip, when this fear was coming. What were they doing? They were praising. Also they danced and danced. They danced for themselves. Don’t care others, and It seemed happy to get together. The dance with beat was very natural. It was not fancy. But The Liveliness of Africa!!! They shared the prayer points, joined hands and prayed together. America – China, Europe etc. Strife – created by greed, hate, religious intolerance and political rivalry, consequently creating refugees and resistance movements. The ministers of all denominations and all the leaders of this community came together to bring peace. 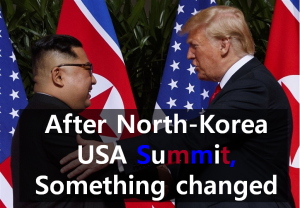 They said, “This is a historic moment!!! It is really so amazing!” (The master of ceremony made a bit of a fuss) They cried out “Please bring peace to our community! Please bring peace to our country!” Peace seems to be so precious to them. So, what is the current flow of the world? But suddenly clouds are gathering on the horizon. President Donald Trump sent an official letter to North Korean leader Kim Jong Un to cancel the summit. President Trump said he knew the anger and public hostility of North Korea’s recent remarks. Especially, he said “You talk about your nuclear capabilities, but ours are so massive and powerful that I pray to God they will never have to be used.” This was a warning remark. However, the US-North Korea Summit was held! Who is the hero of peace? Real Peace? The President Moon Jae-in said, “When the nation fulfills its role, the people can live without losing hope. The reason for a nation to exist is to reassure its people. It will protect them in difficult times. In order for a single person to live like a decent human being as a citizen in the Republic of Korea” But the government has turned away from their desperate appeal. Do you know the story of the late Gu Ji-in? conversion program, not real travel. Sadly, the late Ms. Gu was choked by blocking her mouth and nose at 5:40 p.m. on December 30 2017. South Korea is a country where freedom of religion and thought is guaranteed by the constitution. But it was a sad event in which she was killed by her beloved family during a coercive conversion program, just because she was not a member of the mainstream religious body. Unfortunately, these conversion programs have happened and continue to increase. 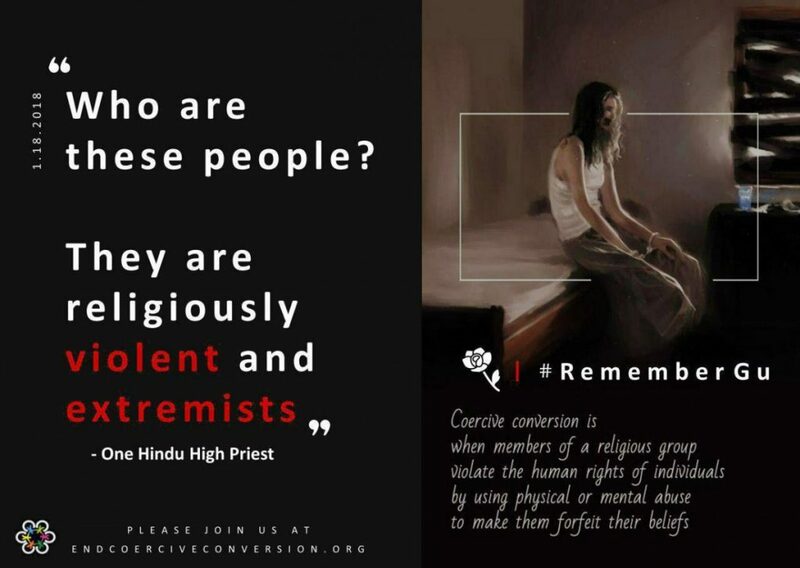 According to Human Rights Association for Victims of Coercive Conversion Programs(HAC), The victims of coercive religious conversion program numbered about 1,000 from year 2003 to 2017. 96 victims were confirmed in the first half of this year alone. 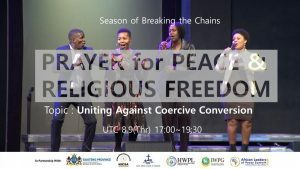 In a survey of 900 people from 2003 to March 2015, 52 percent claimed they were imprisoned, 42 percent of the victims were taken to coercive religious conversion program by kidnapping. It was even reported that 10 people were hospitalized in psychiatric hospitals for not being converted. More seriously, their pain didn’t end there. 77.4 percent of the victims felt extreme fear caused by a violent environment. And 65 percent of the victims suffered from mental disorders and stress due to the coercive conversion program process and the environment. 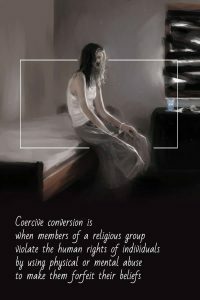 There is widespread condemnation of the human rights abuses of coercive conversion program all over the world. I’ll deal with this at #2.